As a Base umpire, you have several responsibilities involving runners and fielders. Your #1 responsibility, though, is calling runners out or safe. If you are a beginning PHBA umpire (0 – 2 years experience) and plan to umpire 8 – 10 year olds, it is recommended you first gain experience umpiring the bases before progressing to the plate. Most people find the plate more challenging given the constant scrutiny of each pitch and the physical demands of crouching behind the catcher to call balls and strikes. Experience at the bases provides a great initial introduction to umpiring techniques, the speed and pace of the game, and the rules of baseball plus prepare you to umpire behind the plate. The guidance that follows includes how to umpire with others as a team. It is based on an established, simplified approach to base umpiring that is well suited for beginning umpires and consistent with more advanced approaches used by veteran PHBA umpires. Review the topics on this page and you'll be on your way to umpiring the bases like a pro! Where does the BASE umpire stand at the start of each play? As Base umpire you will be positioned at one of four positions, depending on where runners are located on the bases. If you forget what position you should be at when a play starts, stand in the POSITION that is directly in front of the lead runner. As a Base umpire, there are four potential positions to start each play. BU will start in the position just ahead of the lead runner, except when a runner is on 3rd base (3B). In that case, BU will start in C Position. Example: If a runner is on 1st base (1B), BU starts in B Position (just ahead of the runner). If a runner on 2nd (2B), BU starts in C Position. In a two-man crew, BU is never positioned at the D Position. Which bases and runners is the BASE umpire responsible for? With a 2-man crew, the BU has responsibility for ALL bases unless a different arrangement has been made with the Plate umpire (PU). For example, PU may opt to cover plays at 3rd base (3B) under some scenarios and cover come-back plays on runners returning to 1st base (1B) when BU is in a position other than A. Making accurate calls starts with getting to the right place at the right time and where you have a better view of the play than anyone else. There are different techniques you can use to help you get there. Once the ball is hit, track the ball to determine whether the ball is staying in the infield or going to the outfield. 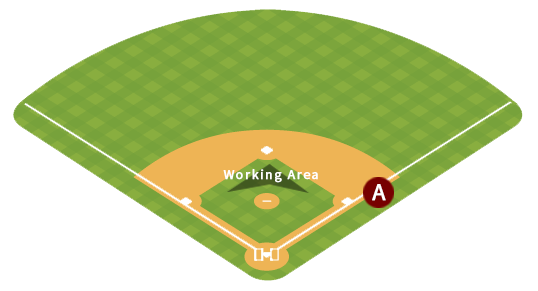 Location of the ball and the fielder that fields it, will help you gauge where the ball will be thrown and where to position yourself for a possible call. By constantly tracking the ball you will be able to assess the fielder's throwing lane to ensure you stay out of the way of the ball as you move into position. DO NOT anticipate where these young players will throw the ball and turn your eyes to where you think the play will be made. Keep your eyes focused on where the ball actually goes and not where you think the ball should be going. If the ball is hit and fielded in the outfield, run "inside" the base path (into the Working Area) to make your call. If the ball is hit and fielded in the infield, stay "outside" the base path to make your call. For balls hit into the outfield, you have more time to get into position and get set, so the timing of the reverse pivot is not as crucial as it is with balls hit and fielded within the infield. Quickly after a hit, jog to the position where you want to make the call from, with your chest facing to the ball. When the fielder releases the ball, you should then reverse pivot on your foot to observe the play at the base / runner. Try to be about 10 feet or so from a play being made on a runner and at a good view angle (90 degrees is ideal) from the throw to where the play will be made. Sometimes the ideal is not possible so favor angle over distance and be stationary at the time the play happens. You want to be firmly set, not moving, when it’s time to make your call. Runner on First Base. BASE UMPIRE (BU) starts in A Position. BU1 moves from A Position into the Working Area in front of second base to make the call at second base. Plate umpire moves up the 3rd base line to make a call at 3rd base. A ball is hit to the outfield. The outfielder throws the ball to 2nd base in an attempt an out on the batter-runner attempting to stretch it to a double. BU1 moves from Slot A into the Working Area in front of second base to make the call at second base. The BASE UMPIRE wiill make the call with hand signal and shout "She's Safe" or "He's Out" or some variation of this. You should use both an arm gesture and shout your call out loudly to ensure all players, coaches and spectators know your call. There's no need to rush your call and you have a lot more time than you think. Watch the play ... process what you saw ... then make your call. There are several, all having to do with rules pertaining to runners and fielders. When you have multiple runners to track, prioritize your attention on the lead runner. The Plate Umpire (PU) will act as Umpire in Chief (UIC). The PU will have responsbility for all LEVEL 1 Umpires. The Plate Umpire will call fair/foul balls and catch / no-catch for both the infield and the outfield. This allows the LEVEL 1 umpires to focus on the base runner actions and calls. ​The UIC will take ALL manager/coach challenges to a call whether made by the BU or PU. Any manager/coach questioning or requiring clarification on any call, will request "TIME" from the UIC upon completion of the play. Once "TIME" is granted, the manager/coach will engage the UIC in conference to discuss the call made on the play. If the call being questioned was made by the Base Umpire, the BU will listen in on the conference but will provide NO input. When the manager/coach and UIC complete their conversation, the UIC and BU will have a separate conversation to either confirm or reverse the call based on the UIC's input. Upon conclusion of their conversation, the BU will make the FINAL call. The UIC will NEVER make the final call on a challenged call made by the BU. The BU will make the appropriate arm motion and loud call. Watch for these rule violations by runners and fielders at the bases and in the base paths. Spotting and enforcing rule violations by runners and fielders is an acquired skill that you'll develop as you become more comfortable with field positioning and making out / safe calls. Don't get too distracted about these as you begin to learn umpiring. Experienced umpires working with you will typically keep an eye out for rule violations across the full diamond to help back you up. Runners leaving early Did any runners leave their base early (prior to the ball leaving the pitcher's hand)? Baseball: If so, "Time" to halt play and call the runner out. Softball: If so, "Time" to halt play and call the runner out. Runner base touches Did the runner(s) touch the base(s)? If not, don't say anything and let play proceed. Untouched bases are rule violations the defense must appeal. Tag-ups Did the runner(s) tag-up on a fly ball catch? If not, don't say anything and let play proceed. This is also a violation the defense must appeal. Fielders standing in the base paths Did a fielder (without the ball) obstruct a runner's advance to a base? If so, you might have an obstruction violation. These are tricky rules to learn so just be concerned at first with the most blatant examples. A fielder without the ball standing in the way of a runner's attempt to touch a base is obstruction on the fielder. After play stops, if you think one of these rules violations has occured, call "Time" and talk with your umpire crew to decide on the ruling. Runner interfering with fielder in the base paths Did a runner interfere with a fielder's ability to field a batted ball? If so, you might have an interference violation. These are tricky rules to learn so just be concerned at first with the most blatant examples. A runner that runs into a fielder attempting to field a ground ball is interference on the runner. TIP: When you have multiple runners to track, you'll be doing a lot of back and forth head turning and body swiveling to keep track of all these runner activities. You might not be able to see everything, so prioritize your attention on the lead runner. Differences between Baseball and Softball. The Double First Base is used in an effort to keep the players safe and to avoid collisions at first base. 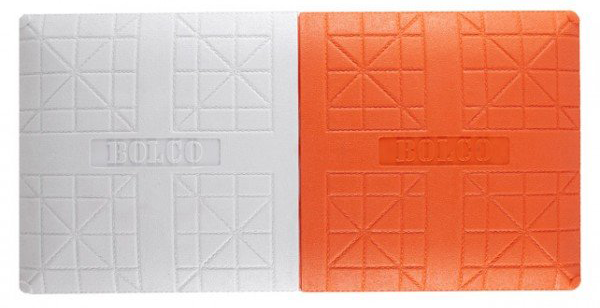 On most plays, the infielder should use the white base and the batter runner should use the orange base. 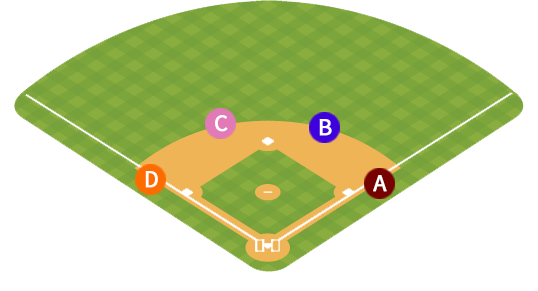 There are times where this is not the case and the batter-runner is required to use the white base while the field is using the orange base. It is important to pay attention to the entire play. Keep in mind, most player contact at first base is incidental and no action other than a Out or Safe call will be required. How are runners affected by the pitcher's circle? There is no such circle or rule. A runner must immediately advance or retreat to a base when the pitcher has the ball within the circle. Failure to do so is an out on that runner (Lookback Rule) unless a play is attempted on the runner. Dropped third strike There is no dropped third strike rule for PHBA Baseball for Pioneer or American. The batter is "Out" on a called or swinging third strike. There is no dropped third strike rule for PHBA Softball for Pioneer. The batter is "Out" on a called or swinging third strike. The American division in softball observes the dropped thrid strike rule. If the ball touches the ground for any reason on a called or swinging third strike, it is considered to be a live ball and the batter-runner may attempt to achieve first base. In the Pioneer division, there is an overthrow rule that limits the runners to advancing one base on an overthrow. This is generally enforced when an infielder makes an attempt to make an out by throwing to a base. When the ball is missed and heads out of play or into the outfield at pace, the umpire shall call "Dead Ball" and advance the runner(s) to the next base. The American division does not have this rule. This is all there is for Level 1. This will be one of the most rewarding volunteer options for any parent, especially those who want to experience the game with the players. For more information on Plate Mechanics and Advanced Base Mechanics, look for our Level 2 and Level 3 Training pages.